8.44 points at 48 votes (rank 31). 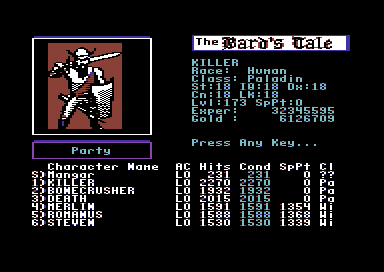 The Bard's Tale is a role play classic and can probably be seen – next to the Ultima series by Lord British – as one of the prime fathers of role plays. You and your party consisting of up to 6 characters plus a possible “special character” (conjured monster or randomly met characters) need to search and destroy the evil magician Mangar. The magician has attacked the town of Skara Brae and has bewitched almost all inhabitants to monsters. The adventure leads you through sewers, catacombs and Harkyn's castle to Mangar’s lair, a giant five-storeyed tower (Mangar’s Tower). ... an animation from the game (German version). Graphics: The game screen is divided into four parts: a window for the happening (upper left), a magic symbol bar directly right to it (here black, see image further below), the party overview (bottom) and an input/output window (upper right). While moving through the labyrinths you get shown a simple 3D graphic of the surroundings. If you encounter monsters, an animated image of the monster type, which is closest to the party, will be shown. Fights are described as vertical scroll text in the input/output window. Sound: Except for one voice music in the title screen and the bard chants there is no sound. Emulator players need to take care of the fact, that parts of the programme need constant reloading. E.g. when using VICE the game needs to b e loaded with the options "True Drive Emulation" ON and "Virtual Device Traps" OFF. Dungeons consist of 21 x 21 fields. Fight: Only the first 3 characters can get into close combat by attacking the two closest hostile groups. 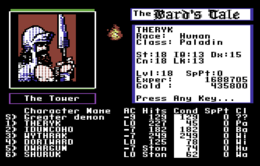 The characters on positions 4-6 can fight the enemies with magic spells, items or bard chants, even those standing too far away for the melee fighters. It is possible to play with the prefab characters on the character disk, the so-called "ATEAM". The controls are completely done over the keyboard. The function keys F1-F4 logically refer to the C64 keyboard (if you play in emulator VICE, there is always an odd F-key identical to the following even key, PC F1 and PC F2 are both C64 F1). If you want to do something in taverns/temples/at the weapon dealer/ in the review board or at quest places, you will be shown the possible keystrokes. Image from the German tape version. Combining the party: Heavy is the head that wears the crown, as you can only have a maximum of 6 characters in the party. For boosting up hit points in dungeons, a conjurer should be in the team, as he can do healing spells, even with an effect on the whole group after some skilling. Furthermore he can conjure different types of summons. Such a summoned party member is placed as the 7th member without any number at the front line in the summon slot S and will accordingly take a lot of hits which otherwise would be aimed at a close combat fighter. If the summon dies, you just conjure a new one. You should also have a bard with you, as he can do wonders with his chants, e.g. chant5 improves the armour class of the whole party. For the beginning, the following combination is suggested: Nos. 1-3 close combat fighters (no matter which ones, e.g. 1.Paladin/Warrior, 2.Monk, 3.Hunter/Rogue), on No. 4 the bard and on Nos. 5 and 6' from the two beginner magician classes Conjurer/Magician each one. If that combination is not fancy enough for you, test your own cominations and check how far you can get e.g. without magician or close combat fighter. But you should save that until you have very strong chars. Fight:' First the magically talented enemies should be eliminated, as they can harm the whole group with their spells. The same goes for creatures that have "breathing" as fighting technique (e.g. dragons, demons), because dragon fire and demon breath also hits the whole party. The next target should be the enemies, which can poison, wither, lame or petrify you etc. For a short shrift with disliked enemy groups (and also for groups with many members) a bard with flame horn or the like is very effective. This item is used during the fight with USE. If the bard as a weak character in close combat is used correctly, he is a very strong character on positions 4-6 in the party list. Of course also the magician can defeat such enemies with magic spells; especially when facing dangerous creatures you can let the bard and the magical chars attack the same group, make assurance double sure! You will of course let the close combat fighters on positions 1-3 attack at first the enemies in their reach, of which most harm can come. Sometimes in case 4 different hostile groups attack, it can be tactically clever that the own close combat fighters leave one member of the weaker, but close enemy groups alive and only defend themselves until the really dangerous enemies standing further away have been eliminated or diminished by bards or magicians. For example it is not advisable to get into close combat with vampires who can even drain a character level from your heros. But be careful: the monsters standing far away can advance during the course of the fight. Skilling: If you think that you have collected enough experience points, you can rise one or more character levels in the review board (=skilling). A general good hint is to send newly created characters several times through the same (already known) dungeons, as they are refilled with monsters every time after a new start. So you can skill your party relatively fast with a calculable risk and collect much gold (which you spend for armour and weapons) by the treasures that you found or by selling euqipment you do not need, before you enter the next really dangerous dungeon. You can also take advantage of the fact that the experience points are always distributed in equal shares to everyone, no matter whether a character actually fought or just kept in defend mode. Just let the novices get accompanied by stronger and “older” characters, e.g. by the characters provided on disk, if you don’t have good characters yet. You then put the new member on a relatively safe slot in the party list (4-6) and let a bard (if strong enough) on 3 for a certain time. This way the new char will make experience and at the same time remain reasonably safe and can be skilled step by step until you can send him into close combat. Summoning vs. Joining: You have to be warned against departing without a conjurer or even short-handed hoping too optimistically to pick up a converted monster (=Joining). If this rare luck happens at all, the monster will take the place in the "Summon slot" S anyway, so it would be rubbish to start as a group of five. Only on very rare occasions, more often towards the end of the game, a monster superiour to the best creature you can conjure will offer to join your group. Up to about the middle of the game, the small number of monsters that want to join the party and also have a good armour class or magic have rather few hit points and are therefore harder to keep alive than a mediocre summon. If you are in a dungeon without a summon and a monster wants to join up, you would of course not refuse, especially not when it is a “demon” or a “dragon” or worse or a “wizard”. Even at first glance useless applicants from the monster realm should be allowed to join as free "cannon fodder", whenever the summon slot is empty, because at least for a certain time no spell points need to be wasted for a summon. If it is reasonably strong monster, but the summon slot is already occupied by a superiour creature, you can either attack the applicant or just leave him alone [key L], depending on whether you are keen on experience points or happy to avoid the fight. All spells are activated, so let’s go into the dungeon of the Mad God. All spells are activated, a demon is summoned, spell points are at their max, hit points too! So let's enter the dungeon of the Mad God - unless you don’t know his name... then the priest will throw us out edgeways. 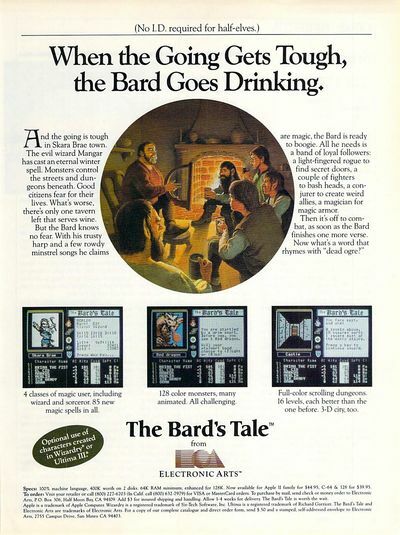 The bard should have a drink in a tavern before each visit to a dungeon in order to use his voice for a longer time. Magic points recover automatically in the daylight. Therefore you should wait until all magicians have their maximum spell points before entering a dungeon. Some rare squares in the dungeons have incoming light through a crack in the ceiling, so that the daylight effect even works below the surface as long as it is daytime. Artificial light can be created either with an item, a magic spell or a bard chant. Some light spells are very costly in terms of spell points if you consider that a simple torch produces the same effect. Before entering a dungeon: If possible, you should cast the armour class, sight, trap protection, orientation and light spells first during daylight and when you are still at the surface, until all magic symbols (shield, eye, flying carpet, compass, light) are visible. If it gets darker, the compass fails or the armour class changes, you will notice this quite quickly, but watch the flying carpet and eye symbols. Since these spells avoid the release of certain traps, they are important, especially if you are on unknown terrain. There is loads of solution material on the internet. The Adventurer’s Guild mentioned in the Links section is absolutely recommended to English speakers. Here you will find everything you want. German walkthroughs and longplays were released e.g. in the 64er and the Happy Computer, both versions can be easily found in the internet , see links below. Which map you use is a matter of taste. The maps by Rob Huston and Warren Ayers are very detailed, but written by hand on squared paper and scanned, which brings them close to unreadable/unclear. You often have to count the squares to understand where you are at the moment while using a walkthrough. The maps by Teran on the other hand were created at the computer and pretty clear by the adding of the coordinates. Both versions can be found in the Adventurer's Guild at "Maps". Beginner party: 1 X paladin, 2 close combat fighters of your choice, 1X bard, 1X magician, 1X conjurer. Later you won’t need that many close combat fighters but at the beginning it is them who make it possible for the magicians to collect the experience which makes them so powerful later. Later: Maybe swap 1-2 close combat fighters by more magicians. Redundant: You don’t really need the Rogue. Chests and traps are best deactivated with magic. Critical hits can be landed by the Hunter much more unerringly and he is more robust. Ransacking the A-Team: If you think it futile to use the prepared characters for protection of the new ones, you should at least grant your party members the complete equipment of the A-Team before the departure. If you even reject this start-up aid, you will have a very very hard and tedious start. Archmage: It is possible and commendable to skill one magician in all 4 types of magic (magician, conjurer, sorcerer, wizard in this order) until he knows every single spell. At least one of those "archmages" should be in the team, before you enter the last dungeon. Run Away: Don’t mistake foolishness for courage. If you face superiour enemies you should rather run away than die. When in doubt leave the dungeon, as soon as you notice that there are enemies for which you are no match yet. You should rather massacre through an already known dungeon again for more skilling. Spell point limit: If the top magician has blown about ¾ of his spell points, it is time to go back to the daylight. Pureblade – a Paladin can use it anytime to heal the hit points of the whole party at once about some points for free. As items can break, it is worth taking two of them. Flame horn – with this a bard can even in higher levels kill loads of fire sensitive enemies such as vampires. Again it can do no harm to have two of them. Spectre Snare – a huge fun, if you just force one of Mangar’s favourite followers into your own party. Hint: do not try on Mangar himself, he is hard to get and stays in party attack mode so that he still does harm to your chars. Kiel's Compass –especially in the dark or on anti-magic fields this is often the last resort, if you have lost your way hopelessly. CAEY: If you do not need to save spell points, you can always use the - apart from darkness/anti magic fields - everlasting night view. GRRE: Goes one better than CAEY as it also reveals secret doors. YMCA: This has got nothing to do with the song of the same name, but gives the team a permanent super armour class. MACO: Useful but not spell point intensive kid’s stuff for the unoriented ones, especially after so-called "spinner" traps. MALE: The eternal airiness lets you float over many traps. SOSI: Endless warning against every trap, as long as there is no anti magic field or the magician doesn’t die. Also informs you if there are stairs or special encounters directly ahead of you. LESU/PRSU/GRSU: If you have a wizard that can conjure a demon, the education was finally worth it. DEST: If any enemy as "Mongo" or even Mangar himself makes any trouble (e.g. by repeatedly conjuring demons), then just retire the involved guy for eternity with the death strike spell. REST: Use it sparsely, a paladin with a pureblade is in doubt the "cheaper" (spell point neutral) choice. Nonetheless, REST is an important spell, since it does not only heal the hit points of the whole party completely, but also poisonings and other monster-caused problems. BEDE: revives dead party members. DISP: Exorcism for obsessed party members. APAR: Only few dungeons are protected against teleport. Therefore it is ideal as an emergency break / ejection seat, if you get stuck again in the deepest monster cellar with many almost-dead heroes. TRZP: The reason why you need not drag a frail rogue boor with you. PHDO: allows the party to go with through a wall without a door. SPBI: Enslaves an enemy into your party. Dragons in Mangar's tower make ideal companions as they often breath fire during combat. They are hardly necessary. Even when a character ‘dies‘ you can bring him back to life by magic or let him be reanimated in the a temple. "Secret" passwords always stay the same. If you know the password once (e.g. from an earlier round or a walkthrough), you can enter the password protected areas before you have played the corresponding quest (for which the password is the reward) with this party. On the internet you find versions with save game editors for manipulating any detail of the character disks you like. The use of those editors is not recommended, as it can kill the whole fun of the game, since developing the characters by collecting experience in fights make the real core of the game. Remember that you can throw the dice initially as often as you want when creating a character, that should really be enough for a good start. As already mentioned, the dungeons are always refilled after restarting the game. Not only can you boost your experience, but also collect quest items repeatedly, although you only need one of each in the party. So you can either let several characters use the same quest item or you got to the "Garth's Equipment Shoppe" and just turn double quest items to money. All the items which you have sold to the trader can be bought back; helpful to players who had carelessly sold quest items without which the game cannot be solved. The newly created bard gets given a fire horn by EL CID. Now you insert the original disk and can theoretically repeat this process as often as you want. TheRyk: "For me this is THE role play adventure par excellence, very well done and atmospherically dense. You can gad about in dungeons for hours to skill your beloved characters and finally solve the quests. Yes, even with the warp function of VICE the game takes hours, days and months, if you really start with new characters and without really cheating. Every game is different, particularly as there are loads of possibilities to individually compose your party. The tangled dungeons with all their perils are truly a hard nut to crack even if you play with maps and walkthrough, because every now and then you will get lost due to traps and teleports. Even for the toughest party, the last dungeon of level 4 keeps a real heap of adrenaline prepared in the shape of horribly mean hordes of monsters. Bard's Tale I really deserves a straight 10." Flodder: "Probably the best role play game that nobody plays anymore. Who cannot remember the endless nights in front of 37cm TVs, equipped with paper and pen to map the numerous horrible dungeons with their bloodcurling traps. In the age of auto mapping and saveable score at any point in the game nobodoy voluntarily bothers with this anymore - although this is exactly what makes the unique and special charm of this unbelievable atmospherically dense game. If I were ever to be banned on the famous deserted island and were allowed to take with me 3 games, then one of it would surely be The Bard's Tale." 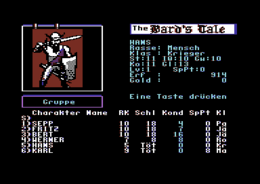 In the sequels of the Bard’s Tale trilogy it is possible to import the characters from part I. 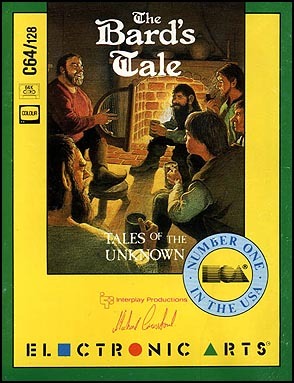 Originally, the name of the series was planned to be Tales of the Unknown and The Bard's Tale only the subtitle. The german tape-version has many translation-bugs and text-alignment-errors. The group Atlantis released a Crack of the tape-versions for the EasyFlash-cartridge (see "Links") with reworked german-translation, trainers and bugfixes. This page was last modified on 4 October 2017, at 19:53.